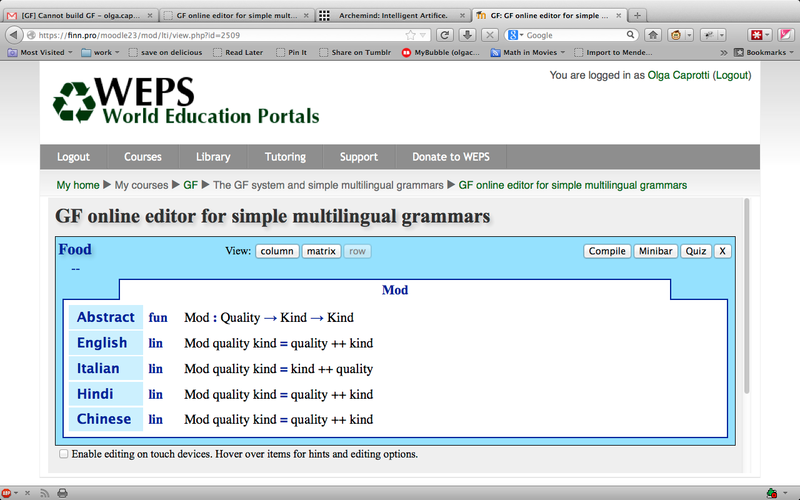 I am currently devoting most of my working time with creating a course for self learners in GF on the WEPS portal. Today I embedded the GF cloud editor as an external activity in the course, exciting to see the GF editor of Thomas smoothly integrated with the virtual learning environment: now the system can e.g. make this activity available only at a certain time. Will need testers for the concurrent use of the activity but I will post later on this, when the draft course is almost done. Yes, I might even redo the CSS for the editor, to fit the WEPS color scheme :) and ease it on the eye of those students who will spend hours working on GF grammars. A big THANK YOU to Thomas.